NGC 7217 is an unbarred spiral galaxy that lies some 50 million light-years away from Earth in the northern constellation of Pegasus (the Winged Horse). It is receding from us at approximately 952 kilometers per second. It is an active galaxy with an active galactic nucleus (a compact region at the center of a galaxy that has a much higher than normal luminosity, probably caused by accretion of mass by a supermassive black hole at the center of its host galaxy). NGC 7217’s main features are the presence of three optical ring-like zones of stars concentric to its bright nucleus. It has a tight, flocculent spiral structure with two spiral arms in the region of the outer ring. This suggests that NGC 7217’s central regions have suffered several starbursts. The outer ring is dominated by bright blue stars and is the location of most of the recent star formation in the galaxy. Although the galaxy is very gas poor for a spiral, this ring is also where we find the hydrogen gas to be concentrated. The galaxy is surrounded by an extensive, nearly circular luminous halo. Other features this galaxy has are the presence of a number of stars rotating in the opposite direction around the galaxy’s center to most of them and two distinct stellar populations: one of intermediate age on its innermost regions and a younger, metal-poor on its outermost ones. An additional noteworthy feature is a symmetric ring of dust that surrounds the nucleus. Other dust lanes are seen mainly on the near side of the galaxy. 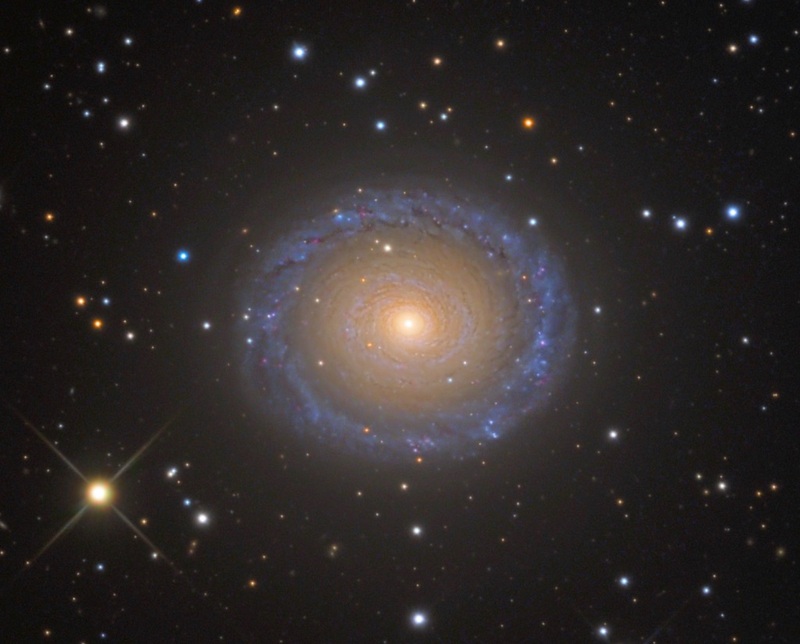 It has been suggested these features were caused by a merger with another galaxy and, in fact, computer simulations show that NGC 7217 could have been a large lenticular galaxy that merged with one or two smaller gas-rich ones, becoming the spiral galaxy we see today. Anyway, right now this galaxy is isolated in space, with no nearby major companions. This image is taken on August 3rd 2010 with a SBIG STL11000 CCD Camera on the 32-inch Schulman Telescope (RCOS) at Mount Lemmon SkyCenter.